The Philips Hue Go light ([easyazon_link identifier=”B00UVHAC1O” locale=”US” tag=”arizonacaorg-20″]$60 on Amazon[/easyazon_link]) is an amazing little portable lamp / accent light that’s controlled wirelessly to emit any color of the spectrum. The Hue Go light has several beautiful pre-set lighting modes, such as “candle mode”, blue/green mode, and a handful of other cool modes or scenes accessible by simply pressing the button on the bottom of the light. In addition to that, use the directions below to control the Hue GO via Voice with Alexa or by using one of several Hue Go apps for Android and iOS. 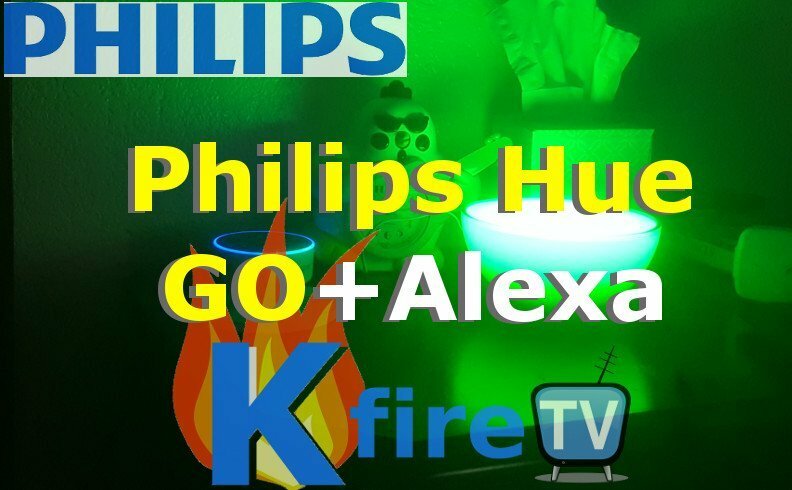 The Philips Hue GO light is a multi-color portable light that is controlled via the button on the bottom of the light, by using apps (of which the best Hue apps are listed in the next section below), or by using Alexa voice commands to control the Hue GO light color. Hue GO can be purchased from [easyazon_link identifier=”B00UVHAC1O” locale=”US” tag=”arizonacaorg-20″]Amazon[/easyazon_link], Home Depot, Bed Bath & Beyond, and Best Buy stores. In addition to using the official Philips Hue app’s Scenes to control the GO Light via Voice with Alexa, we can also use the Huegasm app. The Huegasm app creates a virtual device called “Color loop” which changes the GO Light to all the colors of the rainbow continuously via Alexa voice command. Read about the Huegasm app below. [easyazon_link identifier=”B00CFDT0C4″ locale=”US” tag=”arizonacaorg-20″ cart=”n”]Philips Hue[/easyazon_link] (official) app is a mediocre-quality app that may give some Hue users what they need, while many others will find that other apps are much better than Philips own Hue app. While the official Philips Hue app lacks in several areas, it does allow us to use Alexa to voice command the color of the Hue GO light by saying “Alexa, play <Scene Name> scene”. This works after you’ve already set up a Scene using the Philips Hue app. Huegasm (install it for free from Google Play Store) is a third-party app that allows much more control of Philips Hue lights (especially the color lights like the Hue Go) than the Philips Hue official app gives us. Huegasm “installs” a virtual device into our Alexa devices and calls the virtual device “Colorloop in <Room/Group Name”. For me, this was “Colorloop in lights”. Since this virtual device was visible in the “Smart Home” area of the Alexa app, we are able to refer to it using a voice command! The voice command we can use for this is “Alexa, turn on Colorloop in lights” (or replace “lights” with the name of the virtual device listed in your Alexa app’s Smart Home section). Hue Switcher is another third-party app that delivers better results than the Philips Hue app. [easyazon_link identifier=”B00XNRCC2Q” locale=”US” tag=”arizonacaorg-20″ cart=”n”]AmbiEye for Philips Hue[/easyazon_link] is available on Amazon Apps, but we haven’t tested it out yet. Stay tuned for that. The Hue GO is a portable lamp and accent light which has an internal battery, where on the other hand the [easyazon_link identifier=”B00I12YFP0″ locale=”US” tag=”arizonacaorg-20″ cart=”n”]Hue BLOOM[/easyazon_link] is a stationary lamp which projects an accent light onto a wall and remains plugged into the wall outlet. If you’re wondering whether to get the Hue GO or Hue BLOOM, I strongly recommend that you choose the Hue GO. If you simply just angle the Philips Hue GO light at a wall at the proper angle, it will serve the same purpose of the Hue Bloom (and will give you the portability of the Hue GO’s internal battery!). Only get the Hue Bloom if you only want an accent light – not a portable lamp as well. We recommend you play around with all the various apps that control Philips Hue GO and other color lights, simply because the official Philips Hue app does not fill all of our smart lighting needs. If you have questions, ask on the KFire YouTube Channel or the KFire official site.